Celebrate World Fair Trade Day with 4 fair trade stores in historic downtown Staunton, VA.
Fair Trade is a global movement that ensures that workers and artisans in developing countries receive a fair wage for their work as well as safe working conditions. 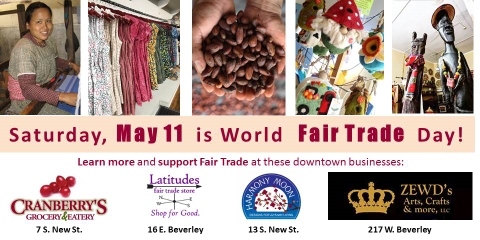 On Saturday, May 11, World Fair Trade Day, Staunton's fair trade retailers will be offering samples of fair trade foods and beverages, discounts off select fair trade products, educational materials about fair trade, a scavenger hunt, and drawings for fair trade prizes. 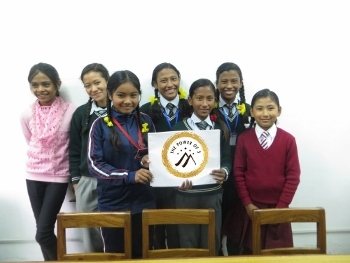 PLUS, 10% of all purchases made at Harmony Moon will be donated to the Conscious Connections Foundation, a non-profit organization supporting the education of girls in Nepal.